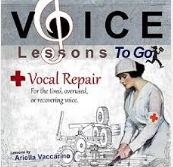 Today is the official release of my CD Voice Lessons To Go- Vocal Repair. 12 Tips to prevent or recover from a tired, overused singing voice. 1. Silence is golden- It is THE BEST thing to do, and will give you the fastest results. Of course silence is not always practical in life. 2. Vocal Rest- This is the second best choice. There are of course many levels of this; not singing, not yelling, not excessively chatting on the phone or with friends. Any rest you can give your vocal chords, will help their recovery. 3. Gentle speaking and singing- Keep everything light. Take the pressure off of your sound and speak gently. Do not whisper (which is bad for you), speak in a relaxed easy, light tone. You should not feel any pressing down in your larynx when you speak or sing. 4. Keep hydrated- Coffee, and non-herbal tea can actually strip your vocal chords of their natural moisture, so watch those things. Drink water and herbal tea with honey to keep your chords in good shape. There is a tea called Throat Coat which is an excellent aid for your voice. 5. Don’t sing full-out on every take and practice- Learn to save your voice for what really counts. If you are rehearsing a show, or song over and over, you can use a gentle voice to “mark” the song instead of blasting each performance like it is opening night. 6. No peer pressure, it’s your voice- If you are feeling sick, or vocally tired, ease off. Don’t feel pressured by others to keep pushing yourself. It will be you on that stage or recording that will have to be accountable for the sound you make when it really counts. Learn to stand up for yourself. If you are tired, let people know that you will be “marking”. It’s probably where we get the term “diva”, and it is spot on and necessary. If a singer does not protect himself, no one will. Be nice about it of course, but always stand up for your voice. 7. If your nose is stuffy sing away, but if your throat hurts when you speak or sing, don’t make a sound!- Pain and hoarseness in the voice when sick usually means swollen chords. Try and sing on those and you can cause vocal nodules (blisters) that can cause long-lasting damage. Shut down your sound and wait for a full recovery before you start back to singing on this one. 8. Sing in the range that suits your voice- Don’t “push and strain” to hit notes. Notes need proper support. If the support is not there, then the wrong muscles get involved which causes strain. People are born with their own range of notes that works. Stick to your range. Of course you can work on extending notes up and down, but do this in your training. Once you master 1 note out of your comfort zone, then go for the next. Also, singing in the right range is not just regarding the high or low notes of a piece. It is also important where the whole piece lays in your voice, this is called the “tessitura”. A full song should feel comfortable in your total range. 9. Sing in the genre that suits your voice- If you have a pretty gentle folk voice, don’t take the part of the belting broadway singer. A soubrette, should not sing dramatic, a crooner should not blast out a big aria. Being able to sing something once through does not mean it suits you. Can you sing that style over and over without strain? That is the test. 11. Warm up your voice before you sing and train your voice!!! !- Singing is like a sport. You would never just run a marathon. You must stretch and ease into a race. Singing is like a race. All your muscles need to be warmed-up so that everything is working to support your sound. Warm-up regularly and train to increase stamina and range. 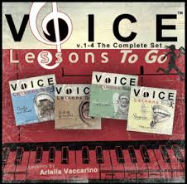 You can use any of my first 4 Voice Lessons To Go CDs to help you with this. 12. When you are vocally tired, EASE back into singing with gentle steps. – You can’t go from 1-100. 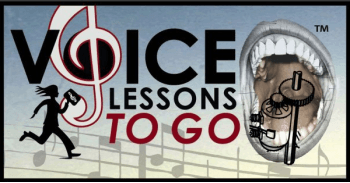 You can use Voice Lessons To Go-Vocal Repair to help you transition from a recovering voice to a healthy one. Having some sort of organized light program is a great tool to get you on track to healthy singing.